Our vacuum pumps and pressure blowers can provide vacuum as low as .2 micron to pressures up to 100 PSI. Thousands of vacuum, air and gas applications exist. Customized options and systems are available. We specialize in helping our customers in difficult applications, and are expert at serving after the sale to keep their systems running at peak performance; long after the product is delivered. Positive displacement blowers are required to create a predictable amount of flow handle chemical gases with various properties such as flammable, corrosive, hazardous, high pressure and high temperature gases. The use of a blower in the Dry Bulk Transfer application is to transfer dry bulk product from the truck to the customer point. The truck blower is required to be rugged due to its exposure to the elements while mounted on the truck. 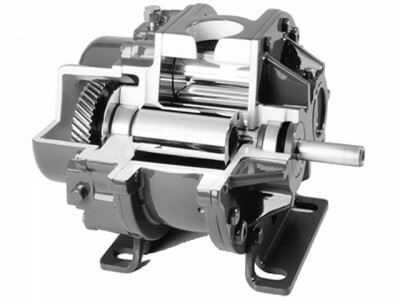 Tuthill Truck blowers are ideally suited for offloading dry bulk trailers. The blowers are typically mounted on tractor frame rails and are driven by transmission mounted Power Take-Offs. Dry bulk trailers are used to transport materials such as cement, flash, sand limestone and other materials used in the construction industry as well as food grade products such as flour, sugar, plastic pellets etc. Tuthill offers the T850 & T1050 lobe blowers and the T650 screw blower. Our lobe blowers provide pressures of up to 20 psi & 17″ HG continuous vacuum capability, include oil reservoirs on both ends and have no ‘external breathers’ which prevents water from leaking into the oil reservoirs. The blowers are supplied with large bearings and drive shafts, and include our patented Shur-Melt Thermal Relief Plugs that provide protection against heat and over pressurization giving users peace of mind and years of rugged performance. The 25 psi capable T650 screw blower utilizes PTFE coated non-contacting screw rotors that prevent degradation of the blower housing and eliminates the need for constant maintenance, common in vane blowers that require on-going vane replacement. Its unique design, an industry first, allows the blower, complete with inlet filter and discharge silencer, to be mounted on the inside of the tractor frame rail saving valuable space. The use of positive displacement blowers in Pneumatic Conveying provides efficient transfer of dry bulk material from point to point at varying pressures and vacuum levels. The MD Pneumatics™ Blower and Tuthill Blower Packages provide consistent air flow regardless of pressure and demand, without contaminating the material in the process. Tuthill’s Kinney rotary piston vacuum pumps are proven to be extremely reliable due to their “no metal-to-metal” contact in the pump chamber, large oil capacity, large oil lines, low temperature operation and vibration free characteristics. Kinney pumps are considered the standard for many vacuum furnace applications and are known for many years of product life with minimal maintenance. The “total cost” of aKinney rotary piston pump in a vacuum furnace application is normally the lowest of any type of vacuum pump available. The “Vacuum Furnace” market is one with many varying applications. The common theme is large chambers used on 2-3 shifts per day cycles. The chambers have various metals inside heated to temperatures in the 2000 degree C range. This produces high amounts of product off-gassing. The vacuum pump needs to a very durable one to handle the high amounts of vapor and off-gassing, which is ideal for Kinney Rotary Piston Vacuum Pumps. Tuthill’s M-D Pneumatics™ rotary positive blowers and blower packages are ideal for a number of applications in the wastewater market. The most common use is aeration where the blower is used to supply oxygen to the aeration tank or pond. Blowers are also used for basic sewage and sludge movement as well as the transfer of digester gases. COMPETITOR PLUS rotary blowers are designed to be interchangeable with equivalent sizes of competitive models. They are rated up to 15 PSIG (1.03 bar g) discharge pressure or 16” Hg (-540 mbar g) dry vacuum. COMPETITOR SL blowers include splash oil lubrication at both the gear end and drive end of the blower. Splash lubrication provides for longer bearing and seal life through improved heat dissipation versus grease lubrication. Many sizes of COMPETITOR SL blowers are available with Tuthill’s unique noise reduction technology with tri-lobe rotors specially designed for maximum displacement and special porting to significantly reduce noise. Designed to be interchangeable with equivalent models from competing manufacturers, EQUALIZER DF rotary blowers offer many distinct advantages such as higher pressure capability (18 PSIG on most models), true, drop-in replacement even to the point of matching the port connector bolt patterns, and helical Gearing to reduce noise. Designed to be interchangeable with equivalent competing models, EQUALIZER RM rotary positive blowers offer many distinct advantages when compared to other brands, such as helical gearing to reduce noise, rotors with integrally cast shafts, positive, locked-in end clearances to prevent internal contact and polished sealing surfaces. PneuMax II compact, low-noise rotary blower packages are dependable and economical low pressure (up to 15 PSIG or 16” Hg vacuum) air sources for many industrial and municipal applications such as pneumatic conveying of bulk powder or seed, fluidization/agitation of bulk powders, wastewater aeration, milking of dairy cattle and motive force for vacuum exhausting and cleaning systems, all at 85 dB(A) or less. Based on the dependable COMPETITOR PLUS™ rotary positive blower, PneuPak is a dependable and economical low pressure (up to 15 PSIG [1.03 bar g] or 16” Hg [-540 mbar g] vacuum) air source for many industrial and municipal applications such as pneumatic conveying of bulk powder or seed, fluidization/agitation of bulk powders, wastewater aeration, milking of dairy cattle and motive force for vacuum exhausting and cleaning systems. Qx™ Blowers are the next generation of blowers from Tuthill. Qx is our high performance, energy efficient blower line that reduces noise while providing long operating life at maximum operating conditions. TI850 heavy duty industrial blowers are designed for high performance applications up to 20 PSIG continuous capacity and are ideal for applications such as carpet cleaning and pneumatic conveying. MD Vacuum Boosters are among the most efficient vacuum boosters available, with quiet operation. Complete mechanical sealing ensures oil-free operation.